Above, this circa 1907 photo was taken from about where Trent Avenue is today. There was really nothing in the area in the first decade of the 20th Century, and it was being used as an air strip. 2124 North Fancher and its barn are visible in the background through the wing of the airplane. Photo courtesy of the Spokane Valley Heritage Museum. Read part one of our three part series on 2124 North Fancher here. Read part three of our three part series on 2124 North Fancher here. The basis for relocating the house site to 2124 North Fancher is unknown. Perhaps that location fit in better with plans for development that Elmer may have had. Water may also have been a factor. The first step in relocating was to dig a 90’ well perhaps 20’ from where the southeast corner of the house would be located. The well is still there, capped over, in the southwest corner of my dad’s old shop. Water for irrigation was raised out of the well by a windmill-powered pump and stored in a wooden tank on top of the “rock pile.” There must have been a hand operated pump to bring up water for laundry and cooking. At the location of the house that burned, water had been carried directly from the river, fetched by means of a bucket on a pole that was mounted on some sort of fulcrum so that it could be swung out over the water, filled, and swung back to waiting hands on the shore. Pictured here, the north porch of 2124 North Fancher, with a group visiting on the lawn, circa 1927. Bertie can be assumed to be one of the adults on the lawn; the rest are guesswork. Note that the side street is Union at this time, becoming Mansfield in the 1940s. Photo courtesy of the Alexander Family Archives. Building a barn 150 feet south of the 2124 location, on what became Knox avenue, was the second step in the process. The barn had a floor in the middle for a living area, and sleeping lofts were built up high. Not all of the family lived in the barn all of the time. A couple of the older girls boarded elsewhere in exchange for providing housekeeping and child or elder care. One account notes that family friends by the name of McCall had a furnished but unoccupied dwelling in the area and made that available to the Alexanders. Bonnie, the second “little kid,” was born June 4, 1903, meaning Bertie had been pregnant at the time of the fire and during the rigors of the subsequent relocation circumstances. The house itself arrived in kit form on a railroad flat car. All of the materials to build a complete house, together with plans and instructions, came in this kit. The lumber was cut to full dimension, meaning a 2 X 4 was a full two by four inches, not the contemporary 1 5/8 X 2 5/8 “two by four.” The cost was about $1,800. There were at least four companies in business nationally at this time who sold kit houses. Internet searches by my brother David and also by myself have thus far failed to uncover the exact floor plan used for 2124. 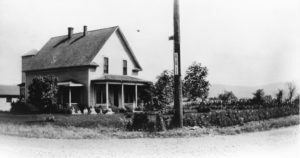 The new house was not quite finished, but the Alexanders moved in and had Thanksgiving dinner there in 1903. The “rock pile” requires some explanation. Before the house kit was assembled, a small cellar was dug out with a team of horses and a scraper. The spoils from this excavation were just left in a heap east of the house. I have to think that the spoils from the digging of the well are there also. In early times the rock pile was covered with an extensive grape arbor. The arbor was gone by the time I arrived on the scene, although volunteer grape vines abounded in two locations on the rock pile. 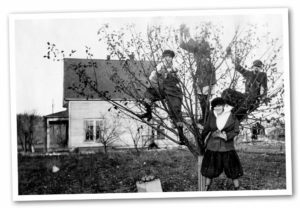 There was also, and still is, an apple tree on the rock pile, started from a similar tree by the original house by the river. The rock pile swarmed with kids during my time. It was a great place to play. Forts could be erected. In summertime, wagons could be ridden down its shallow slopes. In winter, the wagons were replaced by sleds. The rock pile is the only place I have ever flown without the assistance of an airplane. I was asleep at the time of both of these flights, but the sensation of those two dreams is still with me! The rock pile was somewhat reduced in size in 1952 when we took down the old tank house and single car garage/shop and replaced them with a larger structure that required more room, but it is still there today. Muriel, the last of “the little kids,” was born on December 4. 1904. After that Elmer was essentially absent. We know from a clipping from the August 13, 1907 Humboldt Star, a Winnemucca, Nevada newspaper, that he had been prospecting in that area for two years, and was off to Salt Lake City. That puts him in Nevada in 1905. Just exactly when he (effectively) deserted his family in pursuit of his El Dorado is not known, nor is the date of his return to Spokane. It cannot be later than May of 1910, as my father, Robert, was born January 28, 1911. If the local joke—Elmer waited until he got a son, and then left—has any credence, he was more or less gone from that time forward. Bertie and her nine children had a rough go of it. This is 2124 from the south side in the year Bertie divorced Elmer (1917). In the spindly (apple?) tree are Erma on the left, Muriel up top and Dora on the ground. The young man may be a cousin. To the right of the tree, in the deep background is the chicken coop that Paul Staeheli later converted to the wood shed. Photo courtesy of the Alexander Family Archives. The members of Elmer’s extended family described him as someone who saw himself as being above the mundane aspects of making his way through the world. He saw himself, and conducted himself, as an entrepreneur on his way to great wealth, and great fame. He was a handsome man, fluent in speech and could be quite gregarious. In fact, however, his part in the discovery of the Old Dominion Mine was the only extraordinary portion of his life. From that point forward he was all show and no go. He became almost universally despised for the manner in which he neglected his family. His ego knew no bounds. There was an incident one time when he returned to 2124 after a period of absence, apparently expecting a warm welcome from Bertie and the kids. Bertie was reading to them at the time. She kept reading and the kids kept listening. No one acknowledged Elmer’s presence. He became so enraged that he pulled out his pistol and shot a hole in the floor to command their attention. The guy was a real jerk! I am conjecturing here, but I think I understand his mindset. 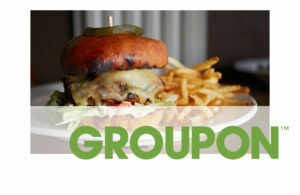 He was the grubstaker for his family. He set them up with a place to live. He grazed cattle and a dairy herd where Felts Field now is. He planted orchards. A truck garden was planted. They were to take it from there. They were to feed themselves from the garden, the chickens, the cattle and the cow. If they needed money they were to sell fruit, produce, eggs and milk. The real money belonged in his care, to be used in pursuit of future fortunes. He could not be bothered by the details of how hard it was to live this way. He needed to be free to pursue opportunities when they arose. In his mind he probably thought he was doing the right thing. He was all alone in thinking that! It was rather common practice in the 19th Century for families to work as a kind of economic unit as Europeans began new settlements west of the original thirteen colonies. 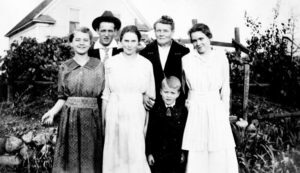 This practice continued on into the early twentieth century, and was one of the reasons for the large families that were so characteristic of the era. Children, among other things, were an economic asset in an agrarian setting. Elmer and Bertie’s large brood was from this perspective not at all uncommon. Very uncommon, however, was the absence of the father for any reason other than death or military service in some war. Farming and ranching involved hard work, man’s work. When there was no man, and not even any male children, the pressure on Bertie was immense. All the girls pitched in to do what they could, which sometimes meant that the older girls would take board and room in other households in exchange for a variety of personal services. Planting, harvesting, feeding and caring for animals, chopping wood—these were activities that children could handle. Obtaining wood to chop, plowing ground, breeding animals and earning money were more difficult tasks. At left, Paul Staeheli on the porch of the “little house,” as Erma called it, built under 200 feet from 2124 on land Bertie sold them. Blanche and Earl Ludwig lived just three blocks east of 2124. Vesta and Ben Hansen lived more than one house, none of which was more than five blocks from 2124. At right, Bertie and Elmer’s youngest daughters. Erma, the eldest, at the bottom; Muriel, the youngest, in the middle; Bonnie, the middle child, at the top. Photos courtesy of the Alexander Family Archives. The Parkwater Grade School on Commerce Avenue was built in 1913, and still exists today in basically its original form. Bertie, still with several of the girls and my two year old father to care for, became the janitor at the school. It was just a block away from 2124, and some of the girls were in attendance there. This job became a source of the cash that was needed for clothing, farm tools and food items that they could not raise or grow themselves. 1917 was the year in which Bertie began to take in boarders, four of them, all Northern Pacific employees. (By 1915 the Northern Pacific had moved its terminal from its Sprague and Division location in Spokane Falls out to Parkwater.) The addition of these four boarders certainly made a full house! My aunt Erma remembers that everyone slept two to a bed, including the boarders, and sometimes the girls slept on parlor furniture. Erma said that at one time—a very short time—there were eight boarders sharing the five bedroom house with Bertie and four of her children. Hard to imagine! The girls washed the bedding, using water from the well and a hand cranked washing machine. Bertie had a fire place out in the back yard to heat water for doing laundry. Electricity didn’t come to 2124 until 1921. The boarders bathed elsewhere. Two of the original boarders took a fancy to a pair of Bertie’s daughters, and ultimately married them. Ben Hansen married Vesta, and Paul Staeheli married Erma. The Alexander girls were a good looking bunch, and attracted the eyes of a lot of men without even trying. The first to marry was Blanche, who married Earl Ludwig on February 2, 1911, just four days after my dad, Robert was born. Two years later Inez married Walter Buckminster, and on October 17, 1914 Ruth married Bill Snapp. Vesta married Bernhard Hansen May 19, 1917. Blanche, Inez, and Ruth went with their husbands elsewhere, but Vesta and Bernhard lived at 2124 for an unknown period of time. Of some note is the fact that eventually every one of the eight girls married. 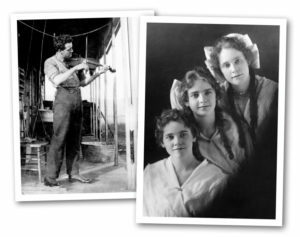 Typically in a family of that size one or more of the girls would not marry, becoming what was known in that time as a “spinster.” Of some interest is the fact that Willie Willey, a well-known Spokane figure who took to wearing just shorts as a means of maintaining his health, proposed marriage to Dora. Dora told him she would not consider it until he could present her with a one carat diamond ring. It might be said that Elmer was not the only member of the family with an interest in digging for gold! In 1917, Bertie took the somewhat unusual and quite courageous step of suing Elmer for a divorce. He contested her action, but on June 2, 1917, the Judge sided with Bertie and she became legally free of him. Bertie appears to have been awarded at least the house and the area enclosed by the alley on the south, the row of Walnut trees on the east, present-day Mansfield on the north and present-day Fancher on the west. I have found no evidence that any provisions for alimony or child support were a part of the divorce decree. In retrospect, the spring and summer of 1917 represented exciting times at 2124. As noted, Vesta and Bernhard married on May 19. Six weeks earlier the United States, on April 6, declared war on Germany. And in June, Bertie won her suit for divorce from Elmer. These were all rather major developments. Above, with the front of 2124 as backdrop, Ben Hansen, second from left, is the other of the original four Northern Pacific boarders to marry one of Bertie’s daughters, Vesta, on the left. Ben and Vesta married in May of 1917, so could be newlyweds in this picture. The two girls in front are unknown. To Ben’s right are Erma, Bertie and Dora. Behind Dora is the infamous mailbox which my six-year-old father, in a fit of patriotism when the US entered WWI, dubbed “Kaiser Bill” and beat into a pile of junk with sticks and rocks. Above, the view is west, toward the back of 2124, against the background of the grape arbor sitting atop the rock pile. 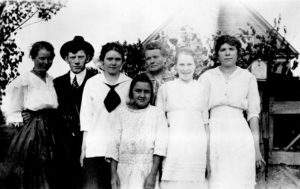 “The Little Kids,” front left to right, Muriel, Bonnie and Erma, are now older. My dad, seven years Muriel’s junior, is in front. Paul Staeheli, one of Bertie’s original four Northern Pacific boarders, is in back with Bertie. Paul married Erma in June of 1920. This photo dates to about 1917. Photos courtesy of the Alexander Family Archives. My father’s response to all the excitement in that time period was rather unique. He killed the Kaiser! The Kaiser was Wilhelm II, Germany’s King. My dad was six years old at the time of the divorce, and had begun showing indications that he felt he was now the man of the house. Possibly under the impression that what men do is go to war, my six year old dad, and perhaps a sister or two, did just that. The mail box in front of 2124 was christened “Kaiser Bill,” and was beaten into junk with sticks and rocks. Bertie was not pleased! The size of the original preemption had shrunk considerably by this time. On April 11, 1904, Elmer and Bertie donated right of way through his land for the building of the Coeur d’Alene and Spokane electric railway in exchange for certain transportation considerations. He took credit for persuading other landowners to do so as well. Subsequent events led him to an adversarial relationship with the railway. He felt they were not making good on their promise to have a station on Western (Fancher), and on one fateful day one of the trains hit and killed Bessie, the family cow. The railway was tardy in taking responsibility for having done this, and it is unclear whether Elmer was ever compensated for loss of the cow. According to his daughter Erma, what had happened was that some local youths had stolen some watermelons from the garden, and had left the gate open on their way out. They apparently broke open the melons on the railway rails, and left the rinds there on the track. Bessie wandered out of the open gate, and was struck by the train while feasting on leftover melon pieces. Elmer punished the Railway by getting his complaints against them into the newspaper from time to time, and by refusing to ride their trains. He had to walk a couple of miles and cross the Spokane River to get to Minnehaha to take the trolley to town, but by golly the C & S Railway was denied his patronage! Two years after the donation of land to the C & S, Elmer and Bertie transferred land for a right of way to the Spokane International Railway on May 8, 1906. I do not know at this time whether this was a sale or a donation. Elmer and Bertie had platted their land south of the where the railroad tracks were laid in 1999. They had named the area Orchard Park, and from that time forth they sold off individual lots on a piecemeal basis to various buyers over a long period of time. The major shrinkage occurred, by Elmer’s account, after he and the mayor of Spokane Falls were riding horses together and Elmer suggested that Spokane’s underground water supply needed protection. He proposed that the City purchase all of the land between the railway tracks and the river. This would include the north 80 acres on Elmer’s preemption, land on which the first house had been situated, and on which he had planted orchards and was running cattle. The Union Stock Yards was also grazing cattle just to the west of Elmer’s preemption. The transfer of the North 80 acres of the preemption to the city took place sometime in 1913. I know of no record of the price paid by the city. Elmer wrote of a thousand dollars an acre, but this seems highly doubtful and may be a misprint. Elmer is clear that the credit for effecting this city purchase (involving several other landowners as well as Elmer), which led to the building of Felts Field, belonged with him. With the removal of the grazing cattle herds, the city transformed the land into a golf course. By 1919, this golf course seems to have succumbed to the formation of a landing strip. There was at least a little aircraft activity as early as 1913. 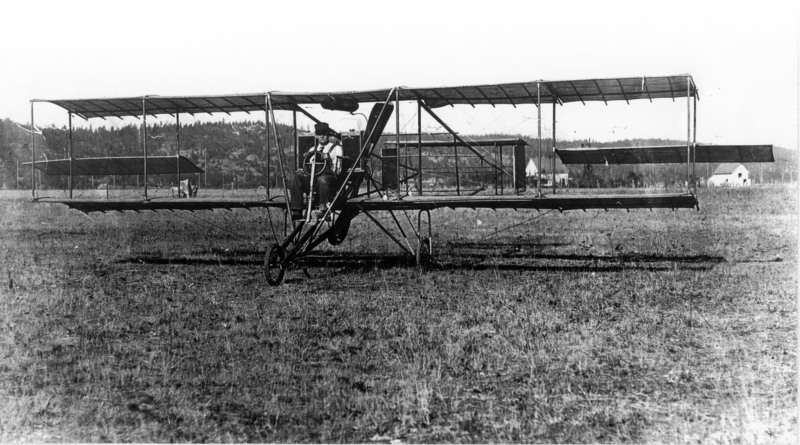 On February 13, 1919, the Spokesman Review reported that 1,000 acres of land had been leased from the City Park Board by the Northwest Aircraft Company. Their intent was to build airplanes there, but this of course also involved building an air strip and giving up the golf course. An interesting sidelight is that the air strip was very rocky, and that the rocks were removed by work gangs of non-violent prisoners from the Spokane Falls jail! 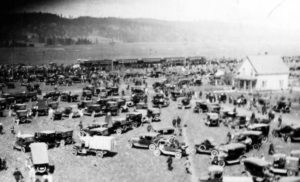 By April 25, 1919, as reported in the Spokesman Review, four Curtis biplanes opened up Spokane’s first flying circus show. It was viewed by 20,000 people, and took place adjacent to the house at 2124. Somewhat surprisingly, I know only one story from this signature event. Some of the girls went up on one of the porch roofs at 2124 and watched a low-level parachuting demonstration. It was noted that one of the parachutists had some trouble, but made it down okay. It was some years later that they learned that the parachutist was Clare Hartnett, who was later to board at 2124 for about five years and become a solid family friend. This circa 1931 photo looks south and shows the general layout of the area at that time. 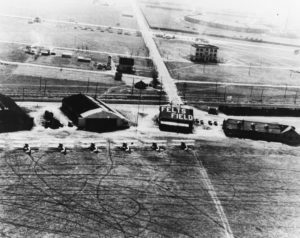 The Air National Guard planes are in the foreground, behind which are three hangars and the administration building. The tracks of the (now) Spokane, Coeur d’Alene and Palouse and Spokane International railroads are next. 2124 stands upper center, with the tank house, garage, Uncle Paul’s garage, and stable/chicken coops that later turned into woodshed, coal bin and monster’s lair to the left of it. The small Staeheli house is the white building at the left edge of the photo. The Parkwater School with the path to 2124 is at the upper right. Photo courtesy of the Alexander Family Archives. The establishment of the air strip brought a new bunch of boarders to 2124—and a bear! There are multiple versions of just what took place when the bear entered 2124. I will relate what I believe to be the most plausible one, dictated by my Aunt Erma to her daughter Pauline at Pauline’s insistence. Erma was there when it happened. The back story is that two of the early aviators, Nick Mamer and Claude Messer, kept a small young bear at the air strip as an attraction. Erma said it was their practice to bring the bear over to 2124 periodically, on a chain leash, draw a tub of water from the Alexander well and let the bear bathe in it. They also carried five gallon cans of water back to the air strip for drinking and for the cooling systems of some of the aircraft, as in its early days there was no source of water at the air strip. On a June day in 1922 the bear somehow got away from Mamer and Messer. Erma had been married to Paul Staeheli for two years, and her son Glenn was about two months old. She and Paul had moved back into 2124 because it made the construction of their “little house” more convenient. The “little house” was located on the two lots Bertie had sold them at the southeast corner of her property, fronting on Knox. Paul could work on the house between his runs on the railroad. His commute was about 100 feet to the house! Erma was inside 2124 when she heard a noise in the bedroom. She entered to see what it was. There was the bear, with its paws up on the dresser, staring at that other bear in the mirror! Erma said the bear took fright—she was not specific about whether the source of the fear was the bear in the mirror or her own presence. The frightened bear scampered out of the house and up onto the porch roof, where it appeared that It would be content to live out its days. Mamer and Messer, after much fruitless effort, were finally able to get the bear down off the porch roof. However they failed to get a grasp on the chain leash, and the bear took off cross country toward the Northern Pacific roundhouse. It being summer, the roundhouse windows were open, and the bear jumped into the roundhouse through one of them. Very shortly the roundhouse work force was seen jumping out of others of them! Finally the bear also jumped back out of the roundhouse. This photo was taken from the roof of the Parkwater School, probably at the time of the 1919 Flying Circus Air Show. Note that there are no outbuildings around 2124, but there is a well-worn path between the house and the school. Bertie worked there as a janitor, and some of her daughters attended school there. At the time of the photo, there are as yet no hangars at the airport. A Coeur d’Alene and Spokane train is visible in the background. Photo courtesy of the Alexander Family Archives. The bear headed back the way it had come. By this time Paul Staeheli had joined Mamer and Messer in the chase. The bear sought shelter through the open door of the Alexander barn some distance south of 2124. Inside was the family cow, tethered to the manger. It is unclear whether the cow or the bear was more afraid. There was plenty of fear to go around, some of it belonging to Mamer and Messer, who wouldn’t enter the barn to get their bear. Now my Uncle Paul was Swiss. He did have a fine dry sense of humor, but when matters of work or duty came up he was all business. I can readily imagine the look of disdain he must have shot in Mamer and Messer’s direction as he entered the barn and retrieved their bear! And after all this excitement, they took the bear back to the back yard of 2124 and let it complete its bath! I believe this to be the most accurate description of Bear Day. The bear did not crawl into bed with Erma, nor did it play any notes on the piano. But I can’t help thinking that the whole incident would have made a wonderful slapstick movie short! The year 1921 had brought major changes to 2124. It was the year that electrical service arrived. Things got a little brighter inside, albeit just from a light emitting from a single incandescent bulb hanging from the center of the ceiling of each room. The wiring was knob and tube, which was the standard of the time. Wall outlets were not a part of the picture at first, and I have been unable to discover when they were installed. There were never many, but I can remember them being there during the War. Probably they were installed when the house was rewired with the more modern Romex cable, but that date has not emerged. Perhaps the biggest change effected by the coming of electricity had to do with the water supply. It made possible the use of an electric pump to bring up water from the well. The decay of the original wind mill and the wood slat storage vat on the rockpile has been noted earlier, although the date of the demise is unclear. My sense is that at the time of the bear story water was being hand pumped. What is known is that sometime in the early 1920s uncle Paul Staeheli built a tank house containing an electric pump and a large galvanized steel storage tank 22 feet in the air. He built the walls on the ground and then, by some means, tipped them up into a vertical position. A large volume of water coming down from a 22 foot height exerts quite a bit of pressure. Although water was not piped into the house yet, fetching it by turning the handle on a valve at the base of the tank house was a lot easier than hand pumping it up from the depths of the well. After the tank house was erected, a single car garage with a small shop area at the tank house end was built abutting the tank house on the north side. The garage and shop were separated only by a wood floor in the shop area and a wood beam bumper to keep the car on the dirt floor in its own end of the building. On October 10, 1927 Clare Hartnett made an entry in his diary about how he had been helping Robert Alexander on his garage that day, and that at the end of the day Clare was able to get his Ford in out of the weather that night. Robert is my father, and he would have been a 16-year-old Junior at West Valley High School at the time. Paul Staeheli, my father’s brother-in-law built a second garage of equal dimension except for the shop area. No doubt my dad helped him. This garage is still there today. It is magical. Small in external dimension, it is huge inside, and contains every car I have ever owned, and a few that I have wanted to own. Or so it was in the two times I dreamed it. I am fervently hoping that the dream will again repeat. It is indescribably wonderful! In an earlier diary entry on September 12, 1927 Clare Hartnett noted the arrival of Charles Lindberg in his Spirit of St. Louis in which he had soloed across the Atlantic Ocean. Lindberg had been asked to participate in the National Air Races later in the month, but was unable to do so. But he did make this fly-in, and a large crowd was on hand to witness it. Hartnett was in the military unit assigned to the airfield, and was given the duty to stand guard over Lindberg’s plane that night. Hartnett was good friends with Ben Hansen, who married Vesta Alexander, and with the other Alexanders at 2124. Thus it was that my dad spent the night with him and the Spirit of St. Louis. Hartnett put Raymond Hansen up in the cockpit of the plane. I was never told in any definitive manner that my dad also got into the plane, but I believe it to be almost a certainty that he did. 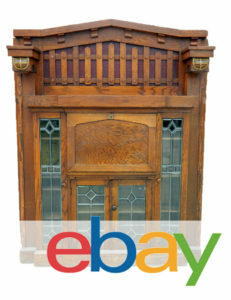 Another structure made its debut sometime during the 1920s, this being a shingled shed with three compartments. The one at the east end was a stable for the cow. I am guessing that one or both of the other two was a chicken coop. Both Bertie and Erma Staeheli kept chickens. According to my dad, the barn had been torn down in 1923. It makes sense that perhaps just before that the stable was built onto the end of the chicken coops. The roof on the stable is a couple of feet higher than the roof over what I believe to have been chicken coops. Erma had 30 chickens, and she estimated that Bertie had at least that many. There is a story that has been handed down about how a pair of rogue, or perhaps wild, dogs got into the chickens, killing 37 of them. Interestingly, the County paid Bertie and Erma a dollar for each of the dead birds, which Erma said was about the going rate. Erma attempted in an April 1985 recording to explain why the chickens could not be eaten and why the County chose to reimburse her and Bertie, but I am too confused about what she said to include it here. At some point there ceased being a cow, and the stable became a storage room. The center compartment was being used as a coal bin, and the western end was a woodshed. The stable was haunted, but only at night. By day we could play in there (we weren’t supposed to), but by night it was occupied with one of the fiercest of entities imaginable. This entity bore me ill will. One of my chores was keeping the coal box and wood bin on the back porch full for use in the wood/coal burning Monarch range in the kitchen. One of my skills was procrastination. It seems I always put off completing my chore until it was dark. I would sneak into the coal bin and fill the coal skuttle as quickly and quietly as I could, and then, scared half to death, I would take off running for the house. Whatever the malevolent entity was, it was always right behind me looking for the other half of my death! It never caught me, and I never saw it, but every time I think about it I can feel the same tingling in my lower back that I felt back then when running for my life was a daily routine! Recently my brothers and sister and I have been sharing childhood memories. Each of them has vivid memories similar to mine about getting coal at night! Also making its appearance in the early 20s time period was a new outhouse. There was no water in the house, so thundermugs served the needs of the inhabitants at night and an outhouse did the same by day. The original outhouse was probably built about the same time as the well was dug. When Uncle Paul moved the chicken coop(s?) in the mid-twenties, the location of the outhouse was moved as well. It sat about midway between 2124 and the house Paul built southeast of it. As described by Erma, the outhouse was a three-holer, two holes for adults and one hole at a lower level for kids. Under each hole was a 5 gallon can, which Erma said Paul had to empty and clean frequently. Just how this was done is lost to history. There is one story that has been passed along (pun intended) about the original outhouse. One day in 1917 or 18 Erma entered the outhouse just after one of the boarders had used it. She saw that he had dropped a $5 bill into one of the cans. She just reached down inside and pulled it out, and then gave it to the man who had dropped it. Other folks might have just told him where it was, but Erma was always the type of person to pitch right in and get things done! The year 1928, in stark contrast to the killing of Kaiser Bill, saw the solidification of the fact that my father had truly become the man of the house. In that year, having already built the garage, my 17-year-old father remodeled the interior of 2124. He wrote that his sister Muriel provided the funds, and that he did the work of putting in water and a bathroom. Space for the bathroom was created by removing the original pantry, which had been located in the room adjacent to the kitchen in the northeast corner of the house. It is unclear whether the water source was the well, or if it was the hooking up to the City water system. I think it was probably the latter. Getting water into the house of course required some means of getting it back out once it had been used. A cesspool was emplaced under the north lawn to service the new bathroom. There was another cesspool under the south lawn for the gray water from the kitchen. This one might possibly have pre-dated the hook-up to City water. In the mid- to late-1940s the City brought a sewer line east along Mansfield. 2124 was allowed to be hooked up to it, which rendered the north side cesspool no longer necessary. The south side cesspool, however, was never connected to the sewer line, and continued to serve the kitchen gray water as long as the house was inhabited. Whether modernization of the electrical wiring was a part of the 1928 remodel remains a mystery. In the Spring of 1929, my dad, now a West Valley Senior, also redesigned the screen porch in the back of the house. The original porch was considered to be “too gingerbready.” The remodeled screen porch was removed as part of the remodel of 2124 begun after it passed out of Alexander hands in 2002. This revealed that the area between the porch ceiling and the top of the porch roof was a light green color. This came as a complete surprise, as the common wisdom seemed to be that the house was white when built and gray when repainted. The exposure of that green patch reveals that for an unknown period of time, which must include 1929, the house was painted a light green color. 2124 has in my lifetime been known for its many trees. The two black walnut trees in the front yard were planted by Elmer, along with the line of black walnuts at the east edge of the property. Around 1930 my dad planted the ten Siberian Elms that line the lawn on three sides. He also planted six Blue Spruce trees, three each on the north and south lawns. These got taken out in 1951. They had gotten very large. I remember the sense of relief it gave me. They were the home of very large black and yellow spiders that just scared me to death! I had many encounters with these creatures, as it was my responsibility to mow the lawn and I had to get up close and personal when cutting the grass under the lower branches. Thanks so much for posting these 3 articles about our childhood home at 2117 Fancher! We grew up with a sense of history inherited from our Grandfather – my memory begins with roll skating on the concrete slabs left from WWII barracks between our house and the railroad tracks and the Felts Field hangers beyond.